Get your car or truck back in gear with the help of our transmission rebuilds. When you begin to have trouble shifting gears, or you start to detect a burning smell, the time may be right for a rebuilding or a replacement of your transmission system. Bring your automobile in for an inspection and let us determine the best course of action for you. When you turn to the ASE™-certified technicians at our repair center, we help you save both time and money. Your vehicle helps you make a living, and keeps your kids safe, so it makes sense to work with transmission specialists who are focused on getting you back on the road in no time. You don’t have to spend more than needed to get a smooth ride when you bring your car in for a checkup. We understand the financial and emotional connection you have with your car, and we want the best for you when it comes to your safety. Our transmission rebuilds provide you the right solution for your vehicle. Extend the lifetime of your existing automobile when you rebuild your transmission, which will ensure that it works exactly as it was originally designed. We know that many of our customers are working as hard as they can to make ends meet. When you don’t have the luxury of completely replacing your existing system, a rebuilt transmission can get the job done just as well. After an exhaustive review of your system, our technicians determine how much of the existing transmission they can utilize. Our team has the tools and the experience needed to rebuild transmissions, and this helps you keep on the road. Even if you have the basic mechanical knowledge needed to rebuild a transmission, this can be a delicate and time-consuming process. When you consider the lost time and the price of most tools needed for this process, trusting our team of mechanics for this type of work is the logical solution. Protect the investment you have made in your vehicle and rely on the transmission rebuild service we provide each day. 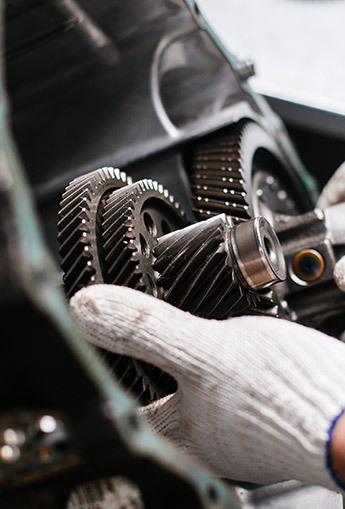 The primary focus of our repair center is your transmission, and that means you get a team of technicians that understands each and every make and model on the road today. Whether you are driving an older model luxury car, or a newer station wagon, we can get to the heart of the issue right away. We take the time to listen to your needs, and our team is fluent in both English and Spanish. This goes a long way toward getting you back out on the road without any needless costs or hidden fees. Take advantage of our transmission rebuild service before it is too late. You don’t want to wait for a small issue to become an expensive replacement job. We make is easy for you to get the help you need for your transmission by offering you financing options as well. Also, we offer services of transmission replacement and updates. Don’t let an unexpected expense like a transmission issue keep you from getting the help you need. Everyone knows that paying up front can be difficult, and we want you to be able to afford our effective transmission service. When you visit our location, we can tell you more about how our financing options can help you. Get a car or truck that runs about as good as new when you take advantage of our transmission overhaul process. With a reconditioned transmission, you get a working system that can keep you on the road for years to come. When you work with a mechanic or amateur you risk even further damage to your vehicle. Our extended warranties are here to give you even more peace of mind. In addition to the 12-month or 12,000-mile warranty we give to all of our customers, we have options for extended warranties. These warranties can cover your vehicle for a period of two or three years. Your technician will be happy to discuss these options with you so you can make an informed decision. The focus of our entire operation is to save you time and money. We understand you have other options when it comes to servicing your car or truck. Our approach is geared toward keeping you as a customer for years to come. This way you and your favorite car can experience the feeling of the open road for years to come. Contact us for the affordable repairs you need and transmission rebuilds that save you money. We proudly serve customers in Gainesville, Buford, Suwanee, Lawrenceville, and Flowery Branch, GA, and the surrounding areas.